We've all made our financial mistakes. Sometimes it takes a mistake to teach ourselves a lesson. But a few financial mistakes do not spell the end of our financial lives. After a battle plan is drawn up. After a few strategic moves are put in to place. After a few tricks and tactics are used to the best of their ability. It is possible to reclaim trust from creditors, lenders, and renters. "Give Me 45 Minutes And I'll Have You On Your Way To A Better Credit Rating, Happy Lenders, And Open Doors!" If you're planning on asking for a loan in the future... If you want to get help from the bank to buy your dream home, dream car, start your own business or more... but feel like your bad credit rating is holding you back. FRET NO MORE. Within my 50 page guide, "101 Legitimate Tips For Boosting Your Credit Score," I'll teach you exactly how the credit bureau's do their business. I'll teach you how to regain their trust step by step, and even show you a few simple tricks for being financially responsible. *And there's MUCH more - guaranteed! You Can Be Proud Of! Do you make these common credit mistakes? ...And decreasing the chances that any lender will trust you anytime soon. If it means the difference between getting the loan and not, that one phone call could mean getting your new car (to replace the old one that might break down on you at any time). But there are some businesses out to exploit you. You've probably seen their shops located around town. And still other places hide behind the fact that they're a "credit repair agency." Don't be suckered! When you read my guide I'll let you in on the real world tactics of businesses who are trying to take advantage of vulnerable people... and organizations who really are there to help you. In 50 pages, I take you on a guided tour through the credit industry. So that you know exactly why your credit rating may be low. Exactly how to begin repairing it starting today. All in order for you to reclaim trust from creditors, lenders, and renters who are only looking at a number. Financial advisors can charge hundreds of dollars for their consultations. And I know my stuff. But here's the deal. Since I've already written all this information up. Since it's all in one convenient spot. I don't need a big pay day. All my credit boostin' information is yours for just $4.95. That covers my costs and reimburses me a bit for my time. And that'll have you optimistic about your financial future. If at anytime in the next three months, you feel like my guide wasn't a good investment, just write me an email saying so. I'll issue you a refund ASAP. Either you feel a sigh of relief, or you get your money back and waste nothing. Just click on the order button above to proceed. You will get immediate access even if it's 3:00 AM. 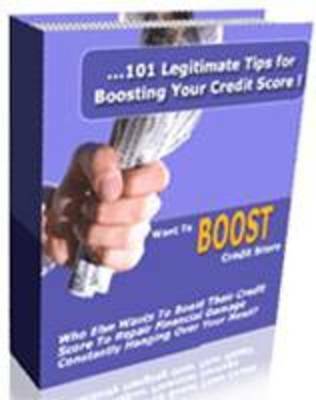 101 Tips For Boosting Your Credit Score! Click Now! P.S. See how easily you can restore your credit rating! If you think your credit will stop you from getting the things you wish for in the future, start boosting your credit rating step by step today. Just scroll up to see how my guide can help you get that loan, apartment, or job now. Grab Your Copy Of "101 Tips For Boosting Your Credit Score!" Now!